Our Best Beach This Month is the marina at Cornet Bay. It’s a busy marina that exudes the charm of a slower time. Perhaps it’s the calm water in this sheltered bay, or it’s maybe the rows of pleasure craft waiting for the weekend mariner. Maybe it’s the giant cedar trees, too many to count that ring these waters. Whatever the reason, Cornet Bay is the perfect balance of marine business and play. 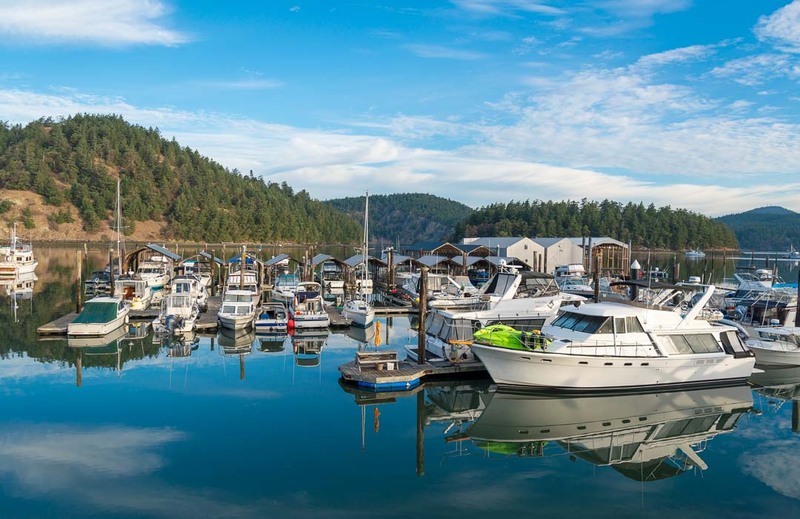 Come to Cornet Bay and you’ll find a bustling marina, a starting point for both business and adventure on the waters of Puget Sound. Those that work the waters head out each morning, challenging themselves and the ocean in order to make a living. There are also a few boats heading out for fun where fishing is often just an excuse for a few days of escape from the pace of urban life. From the center of Oak Harbor (State Route 20 and Pioneer way) drive north 9.4 miles to Cornet Bay Road. Turn right. Drive .8 miles to the marina. 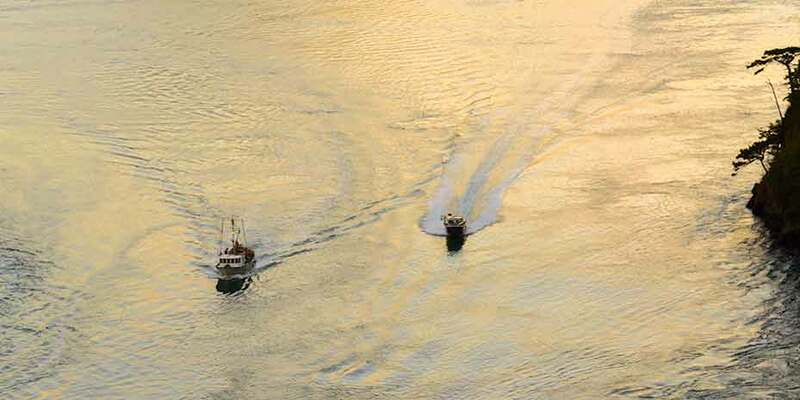 Two commercial fishing boats head through Deception Pass after leaving Cornet Bay. Tourists come to Cornet Bay for a jet boat tour through Deception Pass. In just a few years, Deception Pass Tours has become a must-do for Whidbey Island visitors. 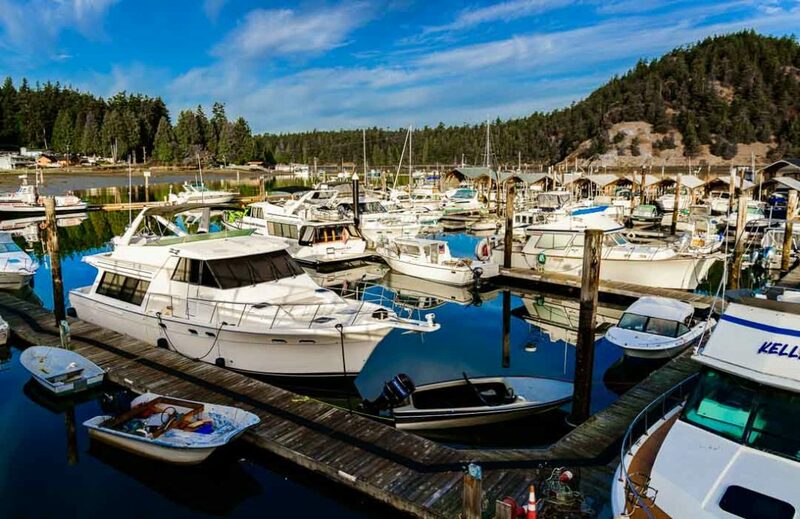 Since the 1960’s, the marina has served all manner of watercraft and a general store has made sure people had everything they need before heading out on the water. The area’s environment has made a recovery. In recent years, petroleum contaminated dirt was replaced with clean soil and new bulkheads that are easier on the environment were installed. But, you don’t have to get on the water to enjoy the area. 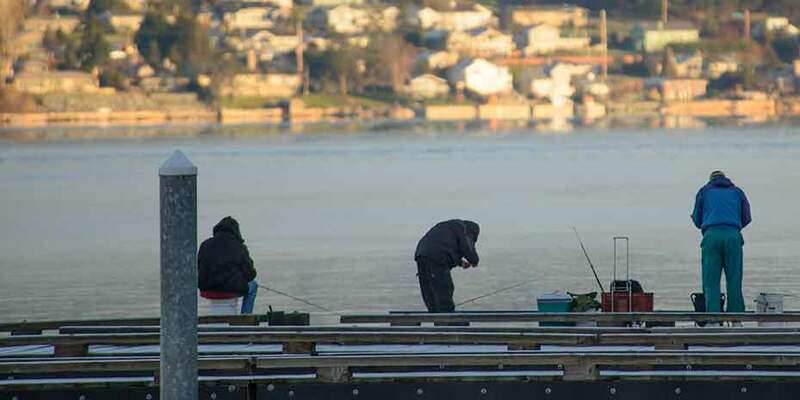 People fish from the docks and the marina is adjacent to Deception Pass state park. Hiking trails here are less crowded than those in the park near the bridge or the beaches. No, Cornet Bay is not an escape to unspoiled nature. Instead, it is a blend of nature and human activity that is something special and a wonderful stop when visiting the island.